This past week I have had help here at StoneFace to get some things done. My son Jon drove over from Seattle. I think he wanted to make sure his dad wasn’t all sick and depressed over losing two mama goats. Or maybe he just missed being here at the farm, or maybe he just needed a break from his job at the brewery. Whatever the reason, he has been here since Monday night and we have gotten a whole bunch done. I had already set most of the posts for the new chicken yard so the first thing we did was brace the corners and string the wire fence. 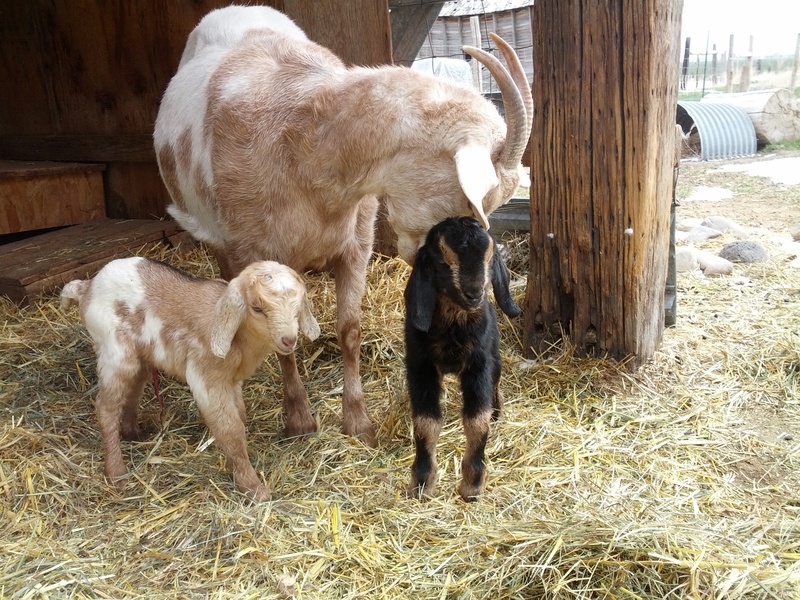 Of course this all happened on Tuesday 4/16 but after the snowstorm and the new baby goats that were born during the snowstorm and my frantic attempts to rebuild the north wall of the shelter. I had taken down the north wall of the shelter because the days were getting warmer. I should have known better. The baby goats were one day later than I thought, but that is within acceptable parameters. JuneCarter delivered them without any need of human intervention, as it should be. Wednesday we then had to “fix” the mismatch between the ground level and the bottom of the fence. Especially under the gate we had to build. Fortunately I still have lots of used tires and a ton (maybe 2) of gravel. 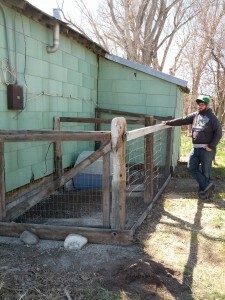 Once we had the fence up and the gate hung we had to install the “pet door”. I went with a small dog size pet door because first it was cheaper, second even the big chickens don’t need a huge door to enter and exit from, and third I can block it so the girls are locked in or out depending on the need. 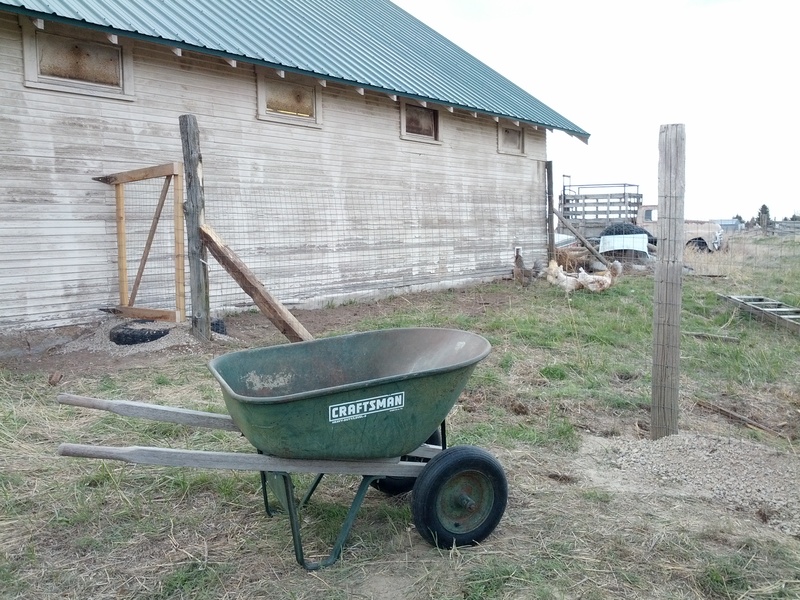 These doors are made to penetrate a much thinner wall than I have in the shop, so we had to be creative, but in the end we got it installed and the chickens eventually figured out how to use it. 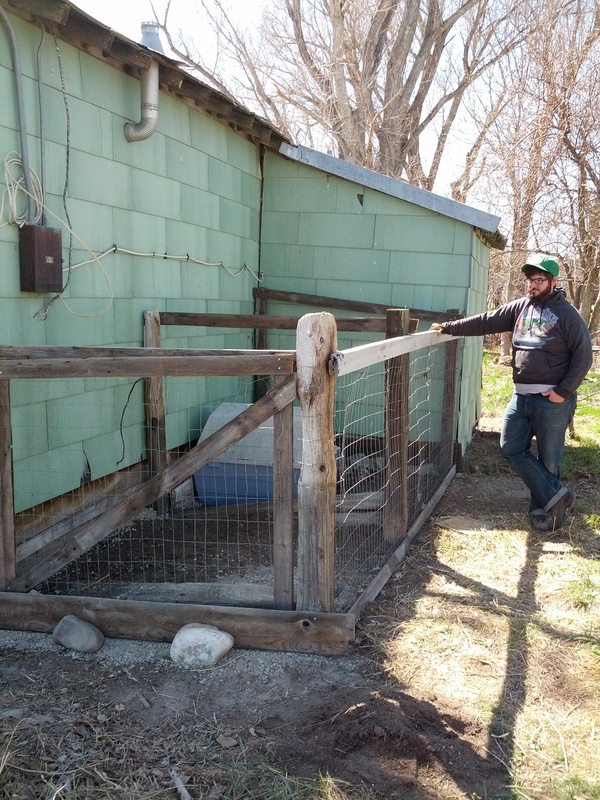 Thursday we worked on the duck pen. As before I had already planted the fence posts so this went quite quickly. Getting the wire up and building a door/gate took the longest. We dug a hole and buried a tire filled with gravel so their water pan would not create a mess. Then we needed to go to the store and buy the feed and water pans and some kind of netting to put over the top to keep the hawks and owls out. We decided to go out to dinner then to the ranch store to buy the stuff and while we were at dinner I got a phone call from Alex asking when we were planning to bring the ducks home. Alex is our high school 4H’er and FFA cowgirl who has been raising the ducks and chickens for me while I get all of the spaces ready. I could not ask for a better person to do the job, she (and her parents) are some of the best neighbors I have ever had. I told her we could take the ducks that evening and the chickens on Friday and she said they would bring them (ducks) down as soon as we got home. When we got home I took care of the dog and chickens and watering the goats and Jon got the netting put up and just about then Alex and her mom arrived with the ducks. I think Alex had gotten rather attached to one of the runner ducks because she was holding her in the car rather than letting her ride in the tub with the others. We put the ducks in the pen and gave them some food and water and they settled right in. Friday we trimmed the bucks hooves. It was supposed to rain and so we planned on starting when the temperature got warm enough. until thursday the temps started out in the 20’s, but that morning it was 40+ when I took the dog out at 6:45 so as soon as we were all up we went out and got that job done. it is a smelly job and one that really takes at least 2 people. You have to catch them and they don’t trust anyone with a lasso in hand. we caught FatHead first, then Buck-O and then Buddy. Buddy did his best to drag me around the pen, but finally they were all done and we moved on to Abby and Rascal. they are so small by comparison that it took very little time or effort to get their hooves trimmed. We were done by 11:00-ish and went in to have lunch and watch “Skyfall”. It started raining while we were eating. A good afternoon to watch a movie. We also went down to the neighbors house and brought the young chickens home after dinner that night. We had heard that bringing them into an established flock at night while the older birds were roosting was less traumatic for everyone. It seems to be working. 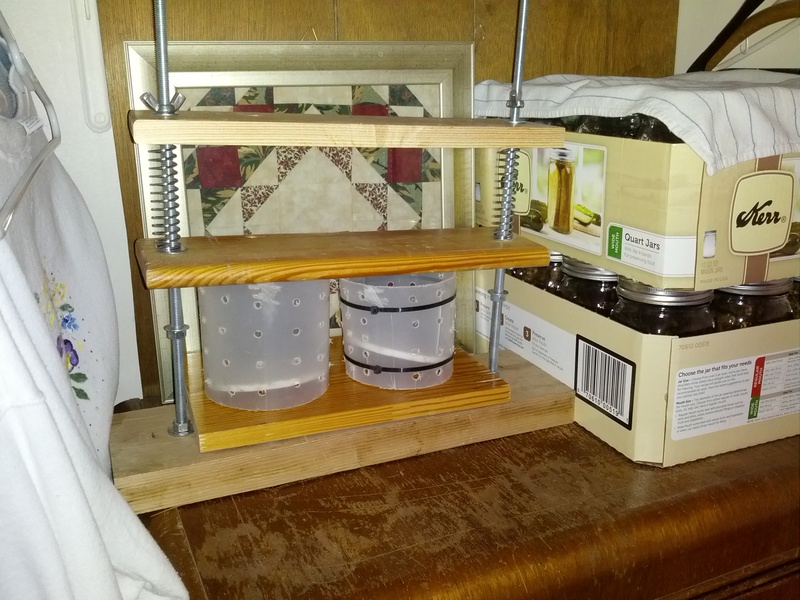 Saturday we waited and Jon built a cheese press. I was waiting for a couple of things. One person was supposed to come out and look at Rosie to decide if they wanted to buy her. They never came out, they never called. The other I will get to in a minute. 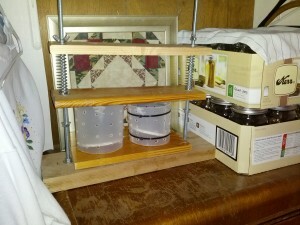 Jon, having helped me with all of the important tasks at hand built me a cheese press. He had told me he was going to do this and I forgot he had said that until he started building it. It took him most of the day and I still have to calibrate it for pounds of pressure, but it looks and will function just like one I have seen online. Handmade gifts are still the best! The other thing I was waiting for was “this guy”. I think everybody knows “this guy”. He doesn’t seem to be a bad sort, talks a lot and has been everywhere and done everything. Or he knows everybody and even knew you way back when. You just don’t remember. This particular guy claims to have gone to school with my wife, and worked for my father-in-law “back in the day” Well, he showed up on my doorstep a week or two back and started talking about restoring tractors and such and all of a sudden he is going to help me get my elvis tractor running. He wants to restore the old farmall and he is going to trade me hay for the old farmall and ………..
My first mistake was not seeing him for what he really is. Just another guy who wants to take all of the old equipment and scrap it for the money he can get. 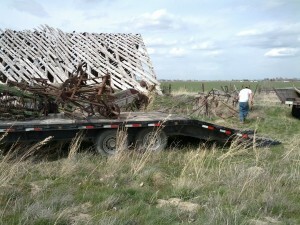 My second mistake was believing him when he said he could get all of the parts “we” needed to tune up the tractor. I was dumb enough to write him a check without seeing the parts. The check was cashed that same day and even though he tells me he has the parts I have doubts that I will ever see them. He was unable to convince my wife that she wanted to part with her dad’s tractor and so he asked if he could have one of the trucks he claims to have driven. 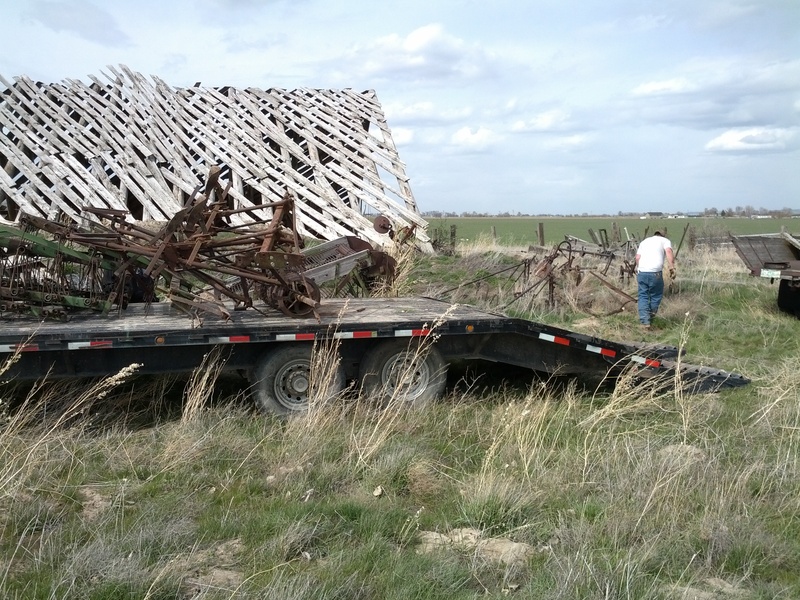 I thought that would be a fair trade for his help and said yes, he said he would be back with a tractor to help “load stuff up” I thought he meant, well I guess I am not clear what he meant. When we came home from lunch on Sunday he was trying to load my nephew’s malibu parts car onto his trailer. We had not even talked about anything except the tractors, so that should have been my next clue. I told him no on the car and then he started asking “Well, what about that old…. ?” Turns out he was going to take some of the equipment I had never wanted to give up. I allowed him to take some real scrap, and this morning I have to give him the boot. I’m sure this will be a stressful day. He came back and he had some parts with him. Told me he still had to get the hoses, and he would be back with the rest of the parts and a receipt and my change. That was supposed to be on thursday. He did come back but only to take measurements and he seems genuinely surprised that I might be angry with him. I still have very little hope that he will follow through with his promise. I don’t think he had any parts until last monday when I called him. And I think he was so late getting them to me because he was still looking for and purchasing them. 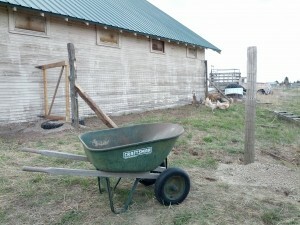 This entry was posted in chickens, goats, on the farm. Bookmark the permalink.